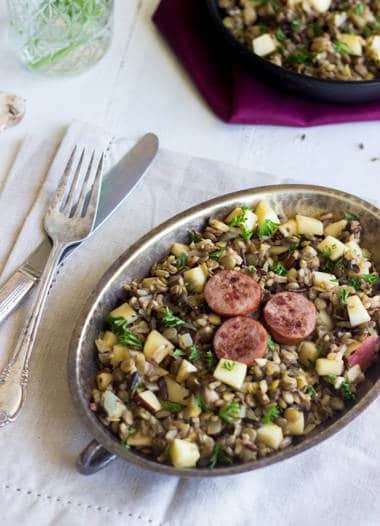 This Lentil Salad with Rice, Apples and Chicken sausage is a quick and easy meal that makes a perfect healthy, weeknight dinner! You know what are the best? Happy accidents. When you think you totally and completely messed something up, and are about to cower under a rock and wave a white flag, and then you realize that the “mess up” made things better. This was that. So that. 1 Million times that. In fact, I even had the pot of lentils hovering over the garbage can until I decided to re think the waste-age. You see, I had never cooked lentils before EVER. I know, I totally live under a rock. But, we don’t have stoves to boil water in Canada. They would melt our igloos. Clearly, I had to wait until I moved to Florida to try to make these. Now, the above mentioned pot of almost-garbage lentils was NOT GOOD. Unless you like really mooshy and soggy lentils. Then, it would be rockin’ your weird-mooshy-lentil-lovin’-socks. So, I cried a little and was about to throw away the whole pot. But I really don’t like to waste (see my exploding freezer of failed baked goods if you don’t believe me) so I decided to keep ‘em and at least develop the flavours of the recipe. Sidenote: Why do I always have mishaps with lentils? Remember the Creamy Peanut Spinach Lentils where I accidentally dumped a WHOLE bottle of sriracha in them? GAH. SHAZAAM! Although the texture was totally off, this lentil salad was DELICIOUS paired with some wild rice, crunchy apples and some other little veggies friends. Oh, and chicken sausage. Chicken sausage is almost like bacon…it just ups the yum meter of anything you pair it with. What started as what I thought to be a total fail turned out to be the dinner that we may or may not have eaten every single night last week. And that is a far cry from Mr. FFF usual dinner of choice – Cheerios. I call that a success. Don’t worry, after that much lentil salad consumption, I can make non-soggy lentils with my eyes closed, hands behind my back and using only my big toes. I’m also really excited to share something with y’all today! I have joined the team at WholeYum as their recipe developer! If you are not familiar with the website, go check it out NOW! They are full of great recipes, tips, and articles on health. So, you’ll see a few recipes posted over there from here on out! Like today’s! click HERE to head on over to WholeYum to get the recipe! I’m glad you got the whole lentil-cooking thing figured out. They are such a staple food! Welcome to a brand new world. 🙂 Going to check out your recipe now. Congrats on the new gig, too. Haha, a brand new world for sure! Glad you could still enjoy these lentils… I love them! And I agree, chicken sausage makes everything tastier! 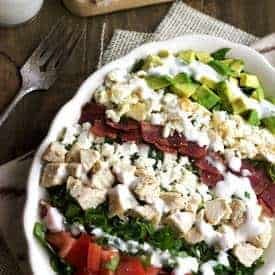 Love this one dish meal packed with protein! Ohhh jeez, here’s where I admit I like soggy lentils: I like soggy lentils. haha! I’d hang around your kitchen any day and wait for soggy lentils to be made so I could scoop up the sog and savour it all for myself 😉 LOVE this rice lentil apple salad!!! That chicken sausage??? UUUUUUGH! Need a pile of this in my life! Happy accidents ARE the best! And this dinner looks SO good. I’m coming over! Happy accidents are the best! I have to tell you, I have never cooked lentils either!!! I really like them, but I just never think to make them! This dish looks delicious though – heding over to check out the recipe now! Me either! They are always over-looked! Wouldn’t mind melting my igloo…winter up here is getting old! I’ve heard! Kinda glad I peaced out…but coming back this month for a visit..yay! 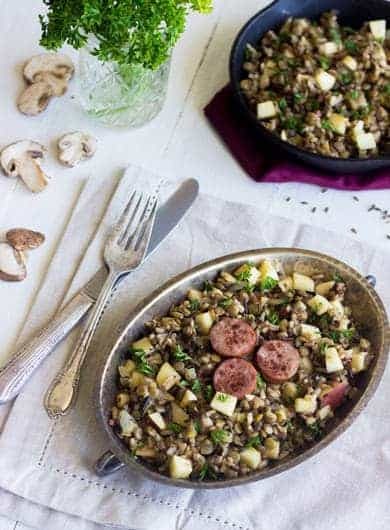 You have balanced out these soggy lentils so well – the flavor combo and texture combo with all those apples/sausage/shrooms and sauces is BRILLIANT! So glad you didn’t throw these away! And CONGRATS on your new role lady! Congrats on joining whole yum! that’s great! Legumes can be kinda fussy to cook, but it saves so much money, and they are so nutritious. 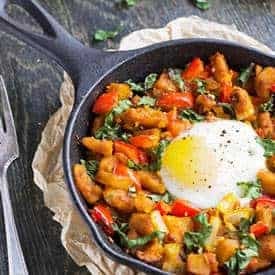 You are totally right…they are tricky, but so yummy, healthy and budget friendly! there is a package of sausage in our fridge crying out for this recipe now! =) great recipe idea Taylor!! 2. Congrats! That’s so exciting about WholeYum! I’ll have to check out their website. This is such a great salad combination! The chicken sausage is my favourite part! IS IT? Best happy accident of life! This is seriously funny Taylor! (stovetops would melt igloos haha!!) 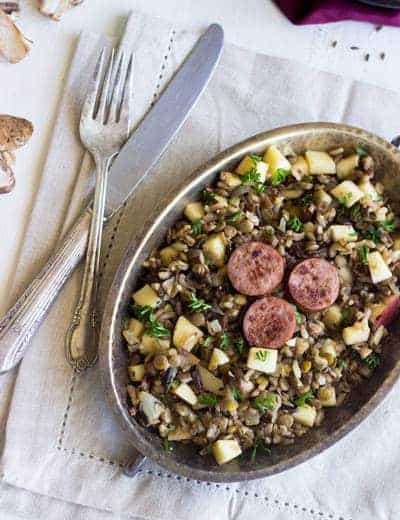 Glad you tried lentils and now have a yummy recipe for us all! Haha glad you enjoyed it 😉 Thanks CHelsea! 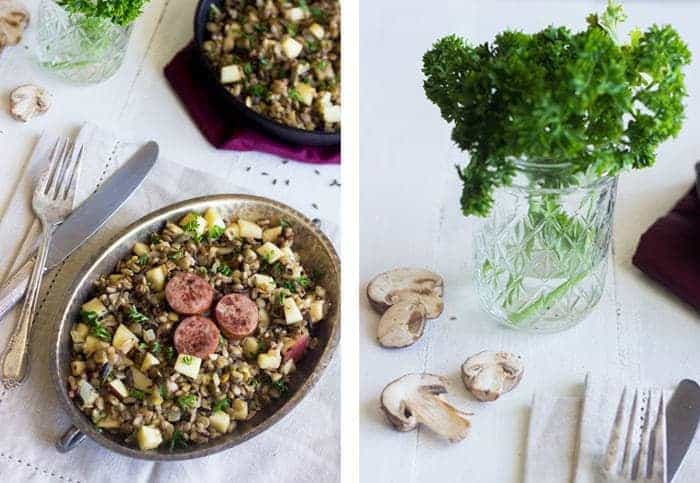 I’ve never cooked with lentils before either, but you’re definitely making me want to! This looks so delicious and filling! Oh you have to try it Kara! Thanks! Yes, seriously sometimes those “mess of dish” recipes turn out to be awesome sauce on a plate. Love all the flavors in this Taylor, especially the chicken sausage. I may or may not be in the love with the stuff and actually just made some this week. YUM! 🙂 Great recipe girl! You MADE sausage? WHOA. You are amazing. ohhh… haha!!! No, I’m not that susie homemaker. I grilled some pre-made chicken sausage. haha.. I would have no idea where to even start with making sausage. EEkk! Haha oh ok! Me either! I was like whoa girl! SO proud of you for persevering with the lentils! I definitely would’ve tossed them out and cried big fat tears. Kitchen disasters and mishaps are never fun! And I just rediscovered chicken sausage in the last 2 weeks and ohmygoodnessgracious… I’m officially addicted. As in I might never want to eat another protein source again. Life wouldn’t be that bad, right? 😉 And congratulations on your new WholeYum title — that’s awesome!! Haha…I was SO close to the tears! Mmkay, well if a chicken sausage ice cream brownie sundae ever appears on your blog, I’ll definitely try that recipe ASAP because I know it HAS to be amazing! I’m right there with you sweetie. My mom always told me that I’d sleep better after crying (and of course, she was right), so a few tear sessions every now and then is actually a good thing! Yes, your mom is right! Sleep so much better! The conference can’t get here soon enough!! I can’t imagine my first ever batch of lentils were superstars either…but I’m so glad you made this a happy accident!! The flavors in this sound A-MA-ZING! Haha I am so glad that I am not alone! Thank you so much Joanne! This looks great! Heading over to see the recipe now! Haha….I’m glad it’s not just me! Congrats to you girl, you need it with all these yummy recipes! Can’t wait to see what you come up with next.. as always! Yay! Go girl!! Congratulations on your new adventure! You’ll rock it! No ovens in Canada – they melt the igloos?!? You are so funny! Love it! Haha thanks so much Gretchen! love that sausage on top! What an intriguing combination of flavors! I love lentil, as well as all the other ingredients in here, so this definitely sounds like a dish I should try. I’m glad this was a happy accident – I think we can all sympathize with that feeling of utter frustration when the accidents are of the maddening variety! Thanks CakePants! Do I call you that?? Haha yup, “CakePants” works for me! Looks like it turned out wonderful! Thanks for linking up with What’s Cookin’ Wednesday! 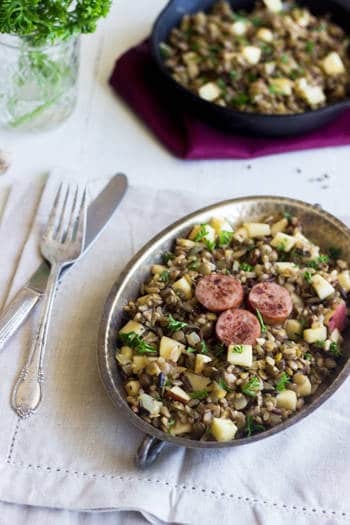 Ben loves lentils – I will totally have to try this soon!! Pictures look absolutely fabulous! Everything looks extremely nice, professional. I JUST moved to Seattle and we have TJs! Your dish sounds BOMB! Like Greek salad with lentils,must try! Gotta go check this out – looks amazing!